Nearly 16% of the full time equivalent students in the California Community College System in 2017-2018 were enrolled in distance education courses, according to DataMart from the CCC Chancellor’s Office. This percentage has doubled since a decade prior. The National Center for Education Statistics reports that nationally, the proportion of postsecondary students who took at least one course online was 33.1% in 2016, with 15.4% of all postsecondary students enrolling only in online courses. Students endeavor to attain their certificates and degrees online for legitimate reasons, including their work schedules, family obligations, location, desired programs, and course availability. Private and for-profit colleges promise Californians personalized, self-paced online programs of study, a model that has informed the California Online Community College. While faculty at California’s 114 colleges strive and innovate to provide online courses without compromising quality, relatively few colleges offer courses online that satisfy the CSU GE Breadth requirements for oral communication or laboratory science. Many faculty in disciplines satisfying these requirements have ardent objections to ever offering their courses online. This perspective precludes students who wish to transfer to the CSU system from completing their degrees completely online. Other faculty have embraced technology and found innovative ways to offer these courses online, which they believe do not compromises course outcomes or quality. The California Virtual Campus-Online Education Initiativ (CVC-OEI’s) Course Finder, “Finish Faster Online!,” provides a tool for students to look beyond their home colleges for these hard-to-find online courses, but courses satisfying the CSU A1 (oral communication) and B3 (laboratory science) requirements remain a rare commodity. Faculty who want students to be able to complete degrees fully online are faced with the challenge of ensuring that those offerings are of high quality. Ultimately, per Title 5 §55202 and §55206, determinations of course quality for online courses and the required approval of addenda delineating regular and effective contact are local decisions and processes. In spring of 2018, the ASCCC Online Education Committee conducted two surveys in an effort to identify effective and promising practices for online courses meeting the CSU GE Breadth oral communication and laboratory science requirements. The survey results may be useful for those who are considering offering these courses online and grappling with whether doing so is possible without compromising outcomes. Historically, one obstacle to offering certain courses online was attaining articulation with CSU. However, CSU Executive Order 1100 (August, 2017) explicitly states that “GE requirements may be satisfied through courses taught in all modalities.” The recently updated CSU Guiding Notes for Course Reviewers states that for their purposes, courses that meet the A1 requirement must include “faculty-supervised, faculty-evaluated oral presentations in the presence of others (physically or virtually)” and that “student presentations will be made either in front of faculty or other listeners, or in online environments… .” The Guiding Notes document also acknowledges that some CCCs have already gained articulation for interpersonal communication and debate courses but states that these courses “are not a natural fit.” This information, taken with C-ID COMM 110’s requirement for “speech presentations in front of a live audience,” highlights the salient challenge for offering oral communication courses online. Disagreement among communication faculty about the appropriateness of teaching oral communication courses online principally hinges on the obstacle of meeting this requirement. The Online Education Committee surveyed faculty who teach courses satisfying the CSU A1 requirement and found that while very few of the respondents— only 14 out of 139—had taught an oral communication course fully online, significantly greater percentages of the respondents identified at least one effective or promising method for students in an online communication course to deliver speeches in front of a live audience, over half designating “synchronous presentation to classmates using web conference software” and “speech before live, in-person audience… recorded by video and submitted to instructor” as effective or promising methods. 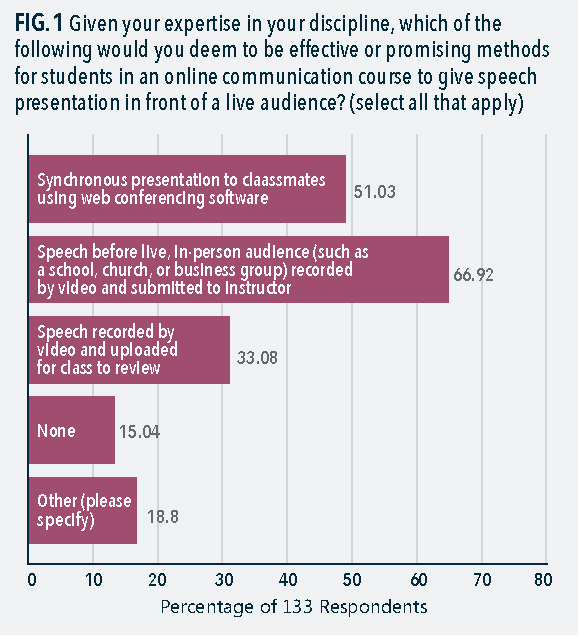 Still a third of the respondents designated “speech recorded by video and uploaded for class to review” as promising or effective, while only 15.04% of respondents selected “none” of the identified practices as promising or effective methods for giving speeches before a live audience in an online class (see fig. 1). Narrative responses to the survey indicated that some faculty use collaborative cloud-based applications such as Zoom, YouSeeU.com, and Google Hangouts. Several faculty raised concerns about the ability to allow for feedback and adaptation in an online speech, and one respondent spoke to the captioning and accessibility concerns associated with students uploading recorded videos for class review. Several respondents voiced staunch objections to oral communication classes ever being offered online. While hybrid courses can be structured in such a way that the speeches may be given in the physical classroom setting, faculty, curriculum committees, and distance education committees who are considering offering oral communication courses fully online may consider the methods identified above as possible ways to meet the CSU A1 and C-ID COMM 110 requirements. Conversations about the appropriateness of online courses meeting the CSU B3 requirement for laboratory science are broader in scope than those about oral communication, in that a multitude of subjects in various disciplines are used to meet the lab science requirement. The ASCCC paper Ensuring an Effective Online Program: A Faculty Perspective (2018) asserts that “While in some fields online labs are currently considered pedagogically unsound, particularly in the natural sciences, experimentation with online labs is occurring in many fields where such instruction would have been once considered impossible, and as such it behooves faculty to remain familiar with the pedagogy around online instruction.” Neither faculty across disciplines nor faculty within a single discipline agree unanimously about the appropriateness or adaptability of laboratory courses to online delivery, but the majority of faculty who responded to the survey did not deem courses in their lab science disciplines adaptable to online delivery. The Online Education Committee surveyed faculty in a variety of disciplines and subjects that CCCs use to meet the CSU GE Breadth B3 requirement, and, allowing respondents to self-identify, received responses in twenty-one of these areas from 395 individuals. 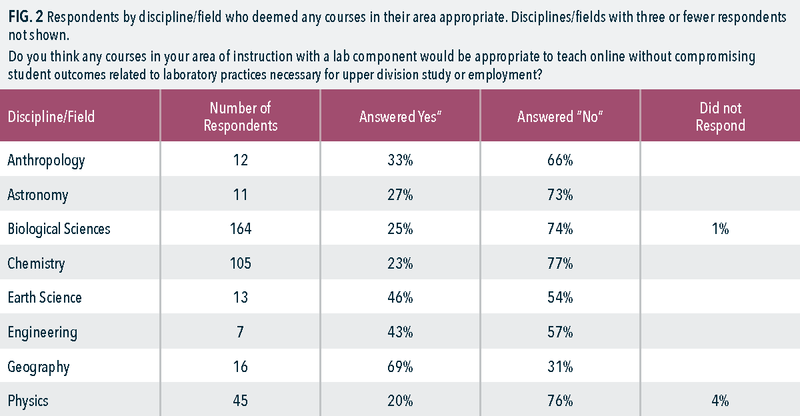 In aggregate, 27% of respondents from these diverse disciplines responded “yes” and 73% responded “no” to the question “Do you think any courses in your area of instruction with a lab component would be appropriate to teach online without compromising student outcomes related to laboratory practices necessary for upper division study or employment?” Only 15% of respondents indicated that they had taught a lab science course online, and some of these same respondents did not deem any courses in their discipline appropriate to online delivery. Breaking down the results by field revealed that, generally speaking, the majority of respondents within nearly all disciplines did not find their courses adaptable to online delivery without sacrificing quality or outcomes (see fig. 2). Geography was an exception to this trend but had few respondents, with 11 of 16 faculty (69%) indicating that they did find courses in their discipline appropriate for online delivery and the remaining 5 (31%) indicating that they did not. Across disciplines and fields of study within lab sciences, a majority of faculty who had taught lab science courses online (84%) and faculty who had not (63%) indicated that GE, non-majors courses were most adaptable to online delivery without compromising outcomes. Significantly lower percentages of respondents who had taught lab science courses online (20%) and respondents who had not (8%) indicated that majors courses were most adaptable to online delivery without compromising outcomes. 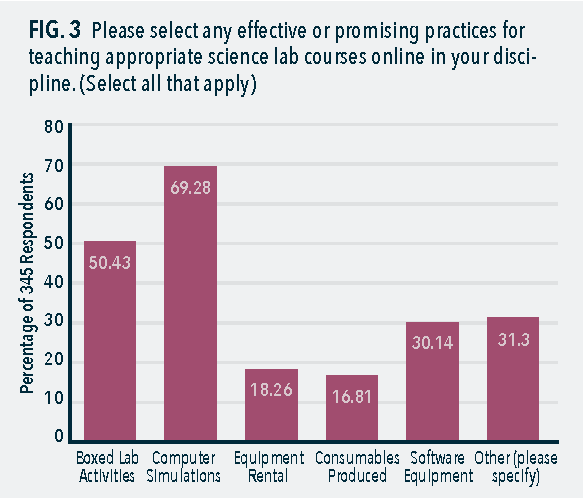 Roughly 69% of 345 faculty respondents selected “computer simulations” when asked to identify effective or promising practices for teaching appropriate science lab courses online in their discipline (see Fig. 3). These applications vary by discipline. Respondents did not have to select any of the responses—40 of the surveytakers did not—and many of the 31% who selected “Other” used the comment field to indicate that they did not deem any practices effective or promising for delivering labs online or to state that in their view no labs in any discipline should ever be delivered online. Student need and course quality remain central to discussions about the appropriateness of certain courses or methods for online delivery. A quick visit to CVC.edu can demonstrate that fully online courses meeting the CSU GE A1 and B3 requirements are available in our system, though not in numbers as great as those for other courses. For-profit institutions of higher education are happy to enroll students in their programs, and perhaps the community college system should be considering the effects of offering so few of these courses online. Academic senates have primacy in curriculum, and, given the parity of quality for courses regardless of method of delivery and the separate review of DE addenda required by Title 5 §55202 and §55206, faculty hoping to create fully GE pathways for students at their colleges may wish to engage in honest conversations about maintaining course quality and identifying regular and effective contact . The responses and methods delineated in the survey results above may be good places to start those conversations.